Unlike those romantic beings who imagine farming as a bucolic and sweet, easygoing fairytale of a life, I am thoroughly undone by the thought of a mere day spent living like a farmer. I don’t doubt that those who choose it can find beauty and joy in many times and places therein, but the sheer intensity of labor and the long, relentless hours required for such a way of life would be utterly and overwhelmingly consuming to a weakling like me. Still, I have tremendous admiration and gratitude for the work that farmers of all kinds perform, and I am far from immune to the attractions of magnificent farm animals, crops and all of the tools and implements and structures that make farming possible. For starters, I would have a pretty meager diet and little to wear if it weren’t for farmers, so I’m very conscious of the gifts and comforts that are mine by virtue of their hard work and the gifts and sacrifices that they and their charges bring to my existence. You should all be thankful for the clothing contributions I receive if for nothing else, given that otherwise you’d be stuck seeing me flouncing around garbed in nothing more than what I could manufacture from leaves and bark, and that’s a frightening thought. But it’s no surprise that in addition to my love of what farmers and farming do to give me a richer existence in such practical matters, as a visually obsessed person I am also admirer and fan of all of the beauties that are part of the seen aspects of farm life. I know I’ve mentioned this before in many ways, celebrating those subjects and objects that enliven my dreams and strike my fancy among rural locales and sights as well as vintage and battered, heavily used and aged, Stuff. If I’m not obsessed with the loveliness of rural life, I’m at least a serious admirer of its visible characteristics. Not smallest among these delights are all of the wonderful and sometimes mysterious machines that populate the properties of farmland. I may lack any ounce of desire to operate any of them, not least of all because I know how hideously dangerous many farm machines are, but I do love to see them, whether in action or at rest. The latter, truthfully, is all the more appealing when it’s of a machine that is so long and hard used that it can’t be operated any further no matter how much elbow grease and baling wire is applied, and it now resides as a totem on the front forty, weeds or flowers embracing its long-flat tires and curling up around its blasted motor. When I think of it, perhaps that’s because I like the thought that I will be held in such an embrace, metaphorically, in my old age. In any case, as I wander through the farmlands along the way of my own life’s passage, I do find they have a great pull on my soul. 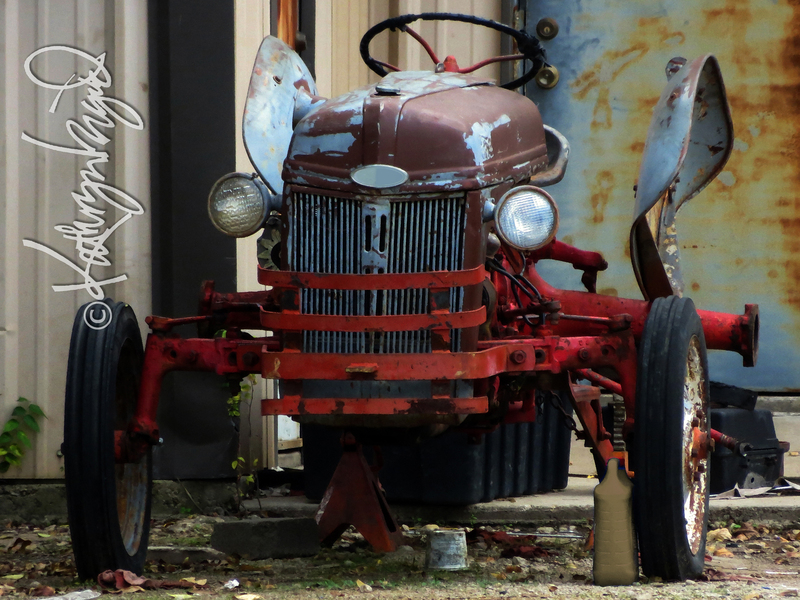 This entry was posted in Aging, Animals, Food, Gardening, Human Nature, Nature, Peace, Texas, Thinking Aloud, TIme, Travel and tagged aging, Beauty, bucolic, clothing, farm machinery, farms, Food, hard work, labor, productivity, rust, tractors, vintage by kathryningrid. Bookmark the permalink. My gosh you have a fantastic way with words. ‘Weeds or flowers embracing its long-flat tyres and curling up around its blasted motor’. ..you did the old girl/ boy proud…such poetry for something past its prime. I am sure I see a smile on her/his face. As an aviatrix is a female aviator, a tractrix is a female tractor (which is to say ‘a puller’). And I’m sure you’re not pulling my leg. Thank you! Where we live, we’re never far from such beauties. That retiree in the photo is parked directly across from an old Texas eatery we frequent, so I get to see it fairly often, but I do love seeing the ones still in motion too. Then here’s a meta*physical* embrace for you, Christine! That is one unique, beautiful tractor! It’s so interesting! Ain’t it sweet? That tractor spends it genteel retirement near a favorite old-school Texas steakhouse we love, so we see it fairly often. In fact, that’s pretty much a one-horse town, so we get to see a bunch of great rusty, rustic stuff on every visit. It ends up feeling like a great unwinding for me just to head out there (especially knowing that the drive may end in fantastic fried green tomatoes or perfect hand-cut fries or-or-or…). Whenever I see stuff like this it really makes me think of so many possible histories/back stories, a large part of why I’m so attracted to it. I love your processing on this one too. A friend of our family, who was an older lady, used to have a raisin farm in Fresno and they had a PINK tractor! Oh how I wish I was into photography way back then. I’ve no doubt that your memory of the pink tractor is, dare I say it, attractive enough! I can picture it now. My maternal grandfather was a farmer and carpenter in his bones, and nothing pleased him more than precious time working with his venerable tools, his sheep, his plantings…. You’ve brought back memories.